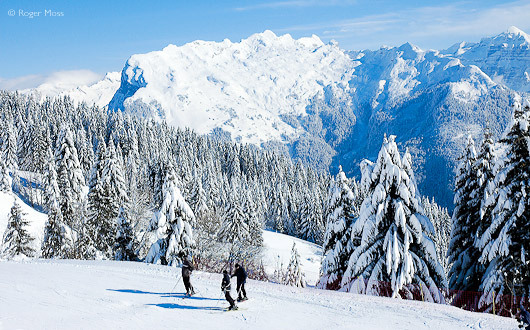 The Grand Massif’s largest ski village supplies an upbeat base for exploring the huge linked domain. Purpose-built Flaine sits in a wide bowl, sheltering it from the worst excesses of passing weather fronts. 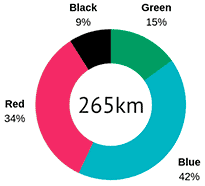 A respectable altitude means slightly longer transfers from Geneva airport than to neighboring Samoëns, Morillon or Les Carroz but it remains one of the shorter drives to the Alps from the UK. Part of the Grand Massif ski area with 265km of pistes. Skiing for everyone here, even dedicated free-ride areas to make the most of Flaine's powder snow. The Grand Massif is deservedly popular with British skiers, who value its wealth of varied terrain, good snow record and the fact that it offers something for just about everyone, including those in search of mileage. Select your lift-pass according to your own hunger for exploration, starting with the Forfait Flaine offering 120km of pistes around the Flaine itself. 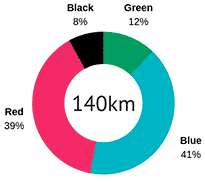 The Forfait Massif, on the other hand, expands things to include the terrain between Flaine and Samoëns, Morillon, Les Carroz and Sixt Fer A Cheval - a total of 145km. Topping off the options is the Forfait Grand Massif, opening up all 265km of groomed pistes, with something for pretty well all levels of skiing ability. Both the lift system and piste layout are constantly being improved, although later in the day there are still signs of congestion on key return runs into Flaine Forêt. Purpose-built ski village with distinctive 1960s architecture. Innovator of many eco-friendly initiatives. Opinion is sharply divided on the hard-edged architectural style of Flaine Forum, but since some of the original apartment blocks are now officially listed as Historic Monuments they obviously have their own fans. And most subsequent developments have sustained the general feel, preserving much of the original unity of the site. All of which makes it refreshingly free from ostentation, and a fun place to be. It’s practical, too, with everything close at hand. Slightly less so, but offering sweeping views over the village is the Hameau de Flaine - seventy or so Scandinavian-style chalets added on an elevated site 2km away by a Norwegian developer during the 1980s. Set between the two is the car-free Flaine Montsoleil resort, originally developed by the Canadian Intrawest Corporation and now owned by French leisure giant Pierre et Vacances. Why go skiing in Flaine ? Mile-hungry intermediates who find the idea of ski-touring appealing, but prefer for the most part to remain safely on-piste - the Grand Massif has lots of terrain, and each sector has its own distinct personality. And getting around is easy, with plenty of Blue-graded cruising for those simply want to glide around the mountains in relaxed fashion and see the sights. Those who normally prefer to stick closer to home might just find things more limiting, though, as all the great scenery lies beyond the surrounding ridges and many skiers waste no time heading off to enjoy them. As for beginners, if you’re keen to make rapid progress then Flaine could be a good choice, as you’ll soon be hankering to leave that bowl and ski what lies above and beyond it. 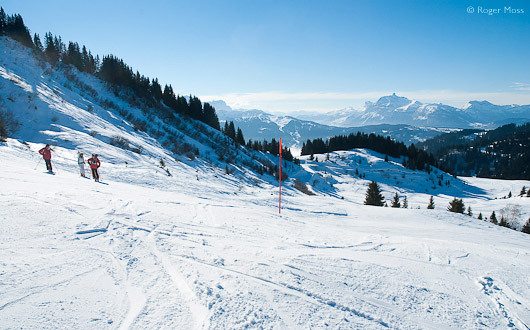 Flaine Fun Zones include a forest-style boarder cross and snowpark, Urban'z beginners zone and Balaken family zone. Take a shuttle bus to the highest and snowiest Nordic ski area in the Alps. Reserved parking at the bottom of the cable car, entrance via Flaine Forum. Under the Cassiopée flats in Flaine Forum (2 places), and Combe de Vernant carpark (2 places). Direct access to most pistes in Flaine and the Grand Massif. See more information on the Flaine website - Adapted Ski. Preferential ski pass price for disabled skiers (conditions apply). Public toilets at Covagnes – one step depending on the amount of snow. For adapted accommodation options contact the Tourist Office + 33 (0)4 50 90 80 01 or ask your tour operator. Ecole du Ski Français (ESF), Ski Ecole International and Flaine Mountain (offer equipment) have specialist instructors. Big-mountain skiing, combined with lively (but not too lively) mood. Capable, modern lift system with convenient hands-free lift passes. Secure learning areas with free lifts for beginners - whatever their age! Areas dedicated to off-piste skiing where free-riders can make the most of Flaine's powder snow. 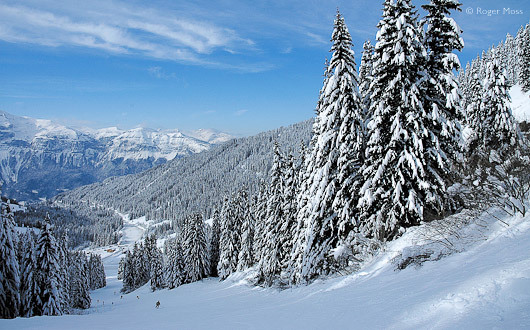 The 14km long piste Cascades - a blue graded adventure suitable for families. Despite improvements, return runs can become congested. Flaine offers plenty of money-saving deals throughout the season - check the Flaine website for details. Le Hameau de Flaine is a small hamlet offering a collection of unique chalets built in Scandinavian style. The lively resort centre of Flaine Forum/Flaine la Fôret and its ski lifts to the Grand Massif ski area is only 2km away via ski or the free shuttle bus. For your convenience, there's a grocery shop, restaurant, bar and reception desk for all information at the heart of the hamlet. All the apartments and chalets are fitted and furnished to a high standard, are south-facing and have some of the best views over the valley. As they're all privately owned, each one is individual and has personal touches, which make them homely, comfortable and inviting. They all have a fully equipped kitchenette with electric hob, oven, fridge and dishwasher (the chalets also have a freezer), TV (with 2 English channels), ski locker and a balcony or terrace. Flaine is a fun resort and there are always events to take part in and other non-skiing activities to try. Ice-driving, pargliding, snow-kiting, helicopter rides, Big Air Bag, snowmobiling - all guaranteed to get the adrenaline flowing. For quieter pursuits, relax those aching muscles in the Aquacentre spa and pool. There's wellbeing treatments, Jacuzzi etc, all in one 2000m2 centre. Then there are a host of guided and self-guided hikes and snowshoe walks to enjoy. You can even go dog-sledding. For information about all activities and current events contact Flaine Tourist Office in Flaine Forum or visit the Flaine website. Situated at the top of the cabriolet lift at Flaine, Le Bissac offers a self-serve or restaurant menu in the warm and cheerful chalet interior. Always busy at lunchtimes, but you can while away a few minutes at the bar waiting for a table. Good quality food and service, though vegetarians have a more limited choice. Situated at the top of the Sairon chairlift in Morillon at altitude 1600m, L’Igloo is a warm and welcoming mountain restaurant. The food is of the highest quality and reasonably priced. We can recommend the home-made vegetable soup with plenty of grated cheese and fresh bread for 7,50 euros. Other snacks, regional dishes, salads, and a plat du jour are available, plus a selection of delicious desserts. The Grand Massif is a full days drive from Calais, mostly on autoroutes. Exit the A40 motorway at Cluses Centre (exit no.19). Take the N205 Sallanches direction, then after 3km turn left at the roundabout in the direction Les Carroz / Flaine on the D106. It is essential to carry snow-chains when driving to Flaine. 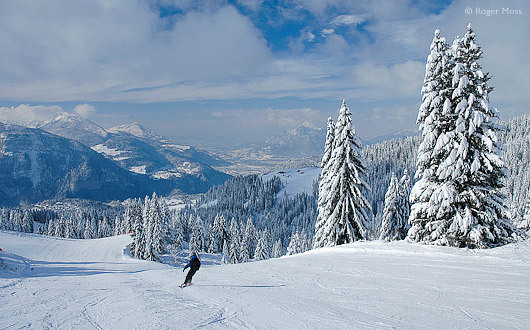 The cheapest and quickest way to reach the Grand Massif from the UK is via a low cost flight to Geneva (70km). Hire a car when booking your flight or book a shuttle bus in advance. See all bus and taxi details here. For the Grand Massif travel by Eurostar from London to Paris then take a train from Paris Austerlitz to Cluses (30km). See all bus and taxi details here. It’s already snowing hard as we pass Les Carroz, with a further 14km of steady climbing ahead of us before we reach Flaine. Around the mid-way point we pass the base station at Les Molliets chairlift, barely visible beyond vast accumulations of drifted snow, leaving us in no doubt that the Grand Massif’s reputation as a snow-magnet is well-founded. By now we can sense that we’re almost there, but nevertheless tackle the final hairpin descent into Flaine Forum with due reverence. Then we see it — the vast snowy bowl bounded more by vast ridges than peaks, and at its heart the unmistakable, assertive outlines of the Bauhaus-influenced apartment blocks styled by Marcel Breuer back in the mid-’60s. Countless images in the press have shown us how it looks; now we’re finally about to see how it all feels. The vast snowy bowl bounded more by vast ridges than peaks, and at its heart the unmistakable, assertive outlines of the Bauhaus-influenced apartment blocks styled by Marcel Breuer back in the mid-’60s. The village is car-free but today, at least, parking is no problem. Within minutes we’re walking around the heart of the village, an experience which proves a lot more uplifting than we’d imagined. As for the architecture, the overall effect, when softened by a pristine snowscape, suggests that style and functionality can co-exist — although quite how successfully is a more subjective judgement. Whatever we might feel, there’s no doubt in our minds as to the quality and quantity of the skiing on offer. We arm ourselves with Forfait Grand Massif lift-passes giving us access to a total of 265km of groomed terrain, allowing us the freedom to seek out the very best conditions, no matter what the weather might decide to throw at us. But there’s more to this decision than mere convenience, as we’ll discover. The Bauhaus-influenced apartment blocks styled by Marcel Breuer, now listed as an Historic Monument. Discovered in 1959 by geophysicist Eric Boissonas, the site was handed to the master of Bauhaus design, Marcel Breuer to create the resort. 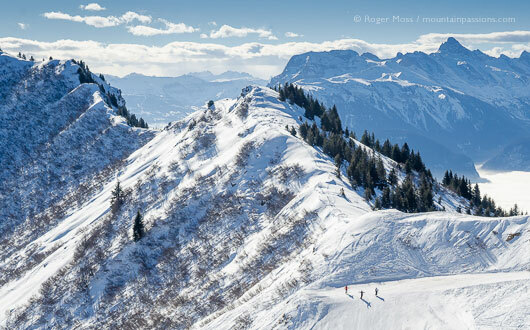 Flaine is now the only ski resort constructed in the 1960’s to be listed as an Historical Monument. Many innovations in resort design were instigated at Flaine including artificial snowmaking in the early 1970’s and gondola and cable-car stations at piste level. Look out for architectural gems including Le Flaine Hotel and the Betelgeuse building. The ecumenical chapel was listed as recently as 2014. 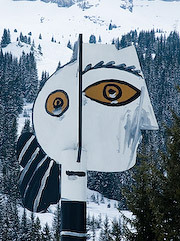 Among the remarkable sculptures that adorn the front de neige are works by Pablo Picasso, Jean Debuffet and Victor Vasarely. 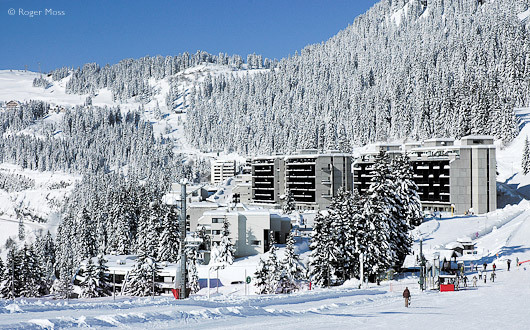 Find out more about this pioneering ski station on the Flaine Resort Guide. Our first days are spent making the most of the fresh snow, sometimes by taking the Grand Platières gondola to the highest point (2480m) in the massif to storm down long, Red-graded runs like Faust, one of our personal favourites. Another similarly-entertaining option involves riding the Aup de Véran gondola over to the steep terrain below the Tête des Lindars (2561m). From here the Diamant Noir traverse link feeds over to Almandine, a long, Red-graded plunge back towards the village. One of the less-obvious attractions of this sector is the easily-overlooked but nevertheless charming Célestine, an innocent-looking Red-graded piste which winds its way down to enter near-silent forest, where it twists, skier-cross style, among the trees before emerging back right beside the village. Just don’t tell a soul about this one. Heading further afield means taking the Grand Vans 8-seater chairlift, notable for the glacial cold of most of our journeys, despite (or because of) its rapid progress. But it’s certainly worth it, even on days when the snow falls, visibility clamps down and we have to put our trust in piste-markings alone for navigation. At times like this the reward is the sheltered terrain among the forests above Les Carroz and Morillon, where we float around contentedly in a silent world as the powder beneath our skis grows ever deeper. We get a whole lot more of this during our final days here, the sustained snowfalls drawing us back to the tree-lined terrain. In fact, the only down-side is that the weather has closed one of our all-time favourite long-distance routes, Les Cascades, which begins at Les Grandes-Platières and ends up an incredible 14km later below a series of frozen waterfalls above Sixt-Fer à Cheval. So we have the perfect excuse to come back. There's a choice of tree-lined blue- and red-graded pistes which run right down to the village.